This post is part of the 50's Monster Mash Blogathon being sponsored by Forgotten Classics of Yesteryear. Over 40 Classic Film Bloggers are taking part in this tribute to the 1950's monster movie. I got in late and thus, I got The Mole People. 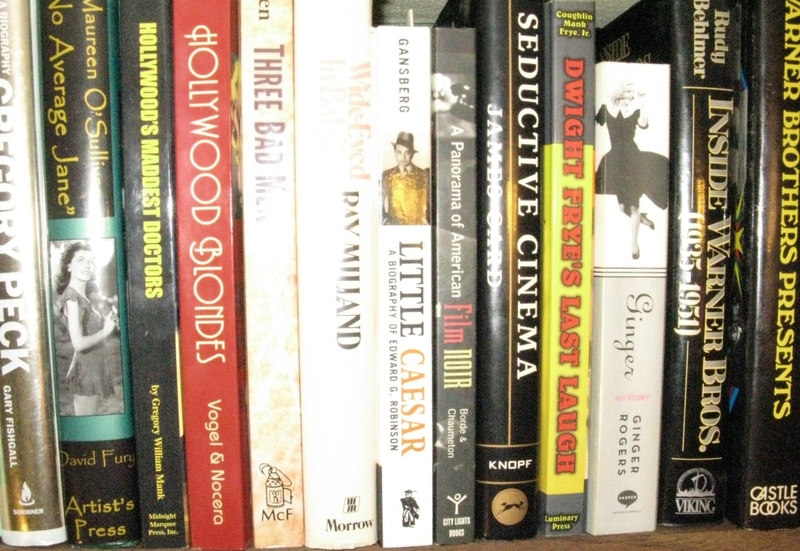 Too bad the Blogathon wasn't last month when I wrote about Them! 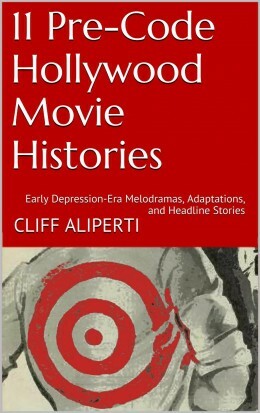 (1954). The Mole People comes with a pretty bad reputation. People really seem to dislike it. Leonard Maltin and Bill Warren have called it the worst of Universal-International's science fiction films. It's inclusion in The Classic Sci-Fi Ultimate DVD Collection has exposed it to a lot of people, and returns aren't good. I watched The Mole People a few times this week while preparing to write about it, and you know what? It's not bad! The Mole People does have a terrible ending. Something happens which really didn't need to happen, but I'm not going to spoil that for you. It also has a terrible title. Yes, it's catchy, and it surely earns the movie more viewers than it ever expected or deserved, but come on, you can't really say it with a straight face, can you? And I won't kid you, there are some embarrassing moments. But on the other hand I found a lot more than I had expected to like about this movie. We start at the very beginning, before the opening credits even, from the desk of Dr. Frank C. Baxter, Professor of English at USC, who enthusiastically imparts the history of thought pertaining to what's found inside the center of the earth. 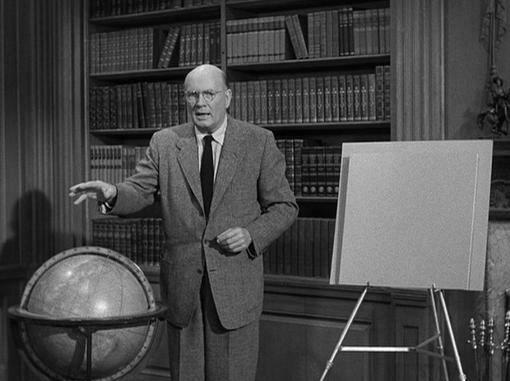 Dr. Baxter, known to fifties theatergoers from their TV sets where he appeared on Shakespeare on TV and as Dr. Science in the Bell System Science Series, makes wild hand gestures as he tells us of Gilgamesh and the Greeks, Dante and other "curious and strange theories." The Doctor shows us bizarre diagrams and explains the 19th century hollow earth theories of John Cleves Symmes and Cyrus Reed Teed. Baxter is loose and personable delivering an entertaining lesson before explaining "This is science fiction, of course. It's a fiction. It's a fable. Beyond fiction." Then it's bye bye Baxter as the title has a formidable moment itself jumping out at us from a steaming pit in the ground which the opening credits then roll out of. I don't know about you, but I'm back on my couch thoroughly entertained just four to five minutes into this one, before meeting a single character! The Mole People stars John Agar, known best perhaps as the first Mr. Shirley Temple, but also a star of several Westerns and Science Fiction films including among the latter genre Revenge of the Creature (1955), Tarantula (1956), The Brain from Planet Arous (1957), Attack of the Puppet People (1958), and zombie forerunner Invisible Invaders (1959). 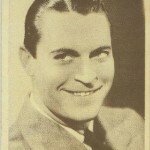 Not known as a great actor, Agar was a familiar sturdy face whose list of credits keeps his name on the tips of tongues of fifties sci-fi fans. Agar is Dr. Roger Bentley in The Mole People, an archeologist working on an excavation in ASIA, as the vague opening shot imparts to viewers. 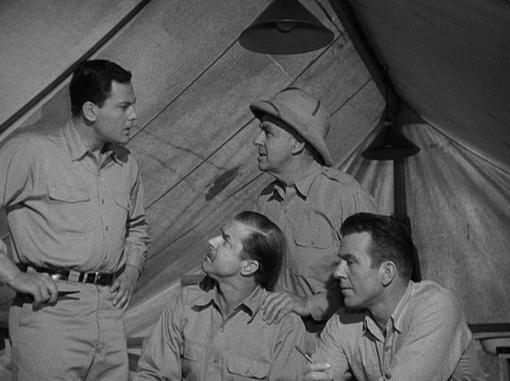 Agar's Roger is working closely with Dr. Jed Bellamin, played by Hugh Beaumont (yes, Ward Cleaver), Prof. Etienne Lafarge (Nestor Paiva), and Dr. Paul Stuart (Phil Chambers), when he finds an ancient stone tablet. The group pauses to examine the tablet determining that the Sumerian writing makes it at least 5,000 years old. An earthquake sets their work back, but also dislodges an oil lamp brought to them by a local boy which has similar writing and references on it as the now broken tablet. The archeologists learn that the ancient Sumerians of the Sharu dynasty sought refuge from the great flood at the top of the mountain overlooking their site, Kuitara. 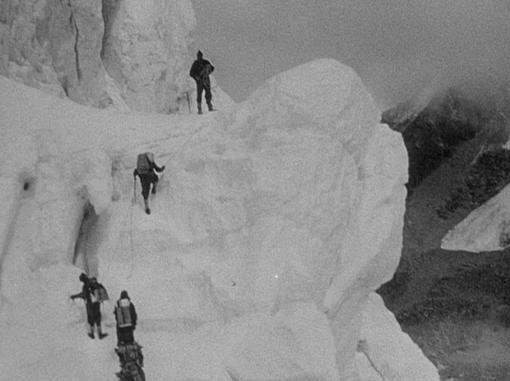 They set about climbing Kuitara, though as director Virgil W. Vogel, making his debut with The Mole People, explained to Tom Weaver in Return of the B Science Fiction and Horror Heroes , this was mostly footage of Sir Edmund Hillary climbing Mount Everest interspersed with Agar and company climbing on a stage (403). When the mountain crumbles and swallows one of their party our heroes lower themselves into the split earth by rope. Another tremble and they're trapped below. They make their way to a lighted area which turns out to be the Temple of Ishtar. As they explore the area we're shown our first hints of the mole people. That night when the men make camp to sleep the mole people emerge from the earth, tie sacks over the explorers heads, and pull them down into the earth in what's actually a pretty effective horror scene. Left on their own a secret passage opens to reveal two albino men dressed as ancient warriors and sporting swords. The men first meet the High Priest (Alan Napier) who holds the Magic Eye of Ishtar overhead and speaks of the secret of death. The High Priest leads them to the King who explains to Roger and the others that they're going to have to be killed because they're either evil spirits or mortals whom the albinos cannot support. Roger has an ace up his sleeve in his flashlight which so badly blinds each of the underground races that they can only shield their eyes and run the other way. The "burning light" gives Roger new power as a god in the eyes of the albino king, and so instead of being killed the group of scientists are now invited to break bread with the albino elite. As fearsome as the mole people look and act we soon learn that the albinos are the dominant race in this world. The mole people are their overworked and routinely beaten slaves who toil in the steaming pits inside Kuitara presumably picking mushrooms or performing some other menial labor. Harsh treatment is also intended for the "marked one," Adad (Cynthia Patrick), a Sumerian woman who "was born with the mark of darkness," in other words, skin pigmentation. After Roger saves Adad from a beating the King gives her to him with the girl more than willing to serve Roger. As Roger continues to get in the way of the albinos in their treatment of the mole people the High Priest steams. He know that Roger's power comes from the flashlight and hopes to prove that whoever has the light has the power. You know those batteries have to die some time and certainly everything is going to come to a head once they do! 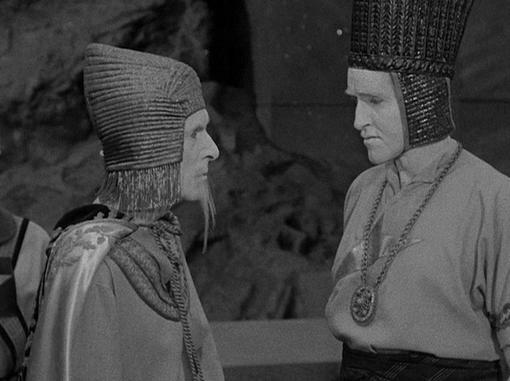 The story has its slow spots seemingly meant to stretch it to 77 minutes, and yes that run time includes Dr. Baxter's opening monologue, but The Mole People provides some good visuals including the somewhat freaky appearances of the King and High Priest, a quick view of some albino dead whose bodies have been charred by the god Ishtar, as well as the impressive tunneling done by the mole people. The monsters of the title are unfortunately the least impressive visual element of the film with their fake back humps and berry textured heads. They're at their most fearsome when mostly obscured by their tunnels. It's a shame the story couldn't have limited them to that. Their weakest trait may be their backstory as there's no explanation of where or why these mole people came from. I suppose they're some sort of evolutionary blip that comes of being confined to this single mountain (we hope!). 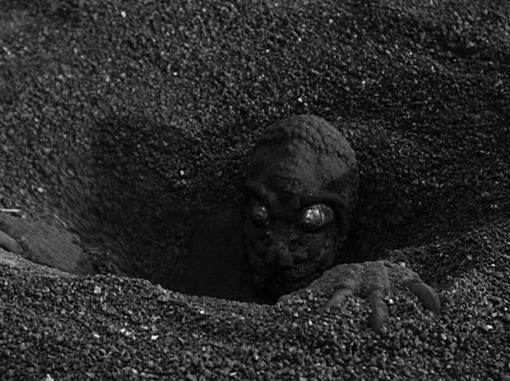 The Mole People is a fun picture. It's by no means a great movie, but it's got enough going for it to call it good. John Agar was fine in the lead and Hugh Beaumont and Alan Napier were both solid. Cynthia Patrick doesn't hurt things too much. My favorites were actually Nestor Paiva, who mostly acts terrified, and our friendly face from the open, Dr. Frank C. Baxter. Don't make The Mole People your first fifties sci-fi movie, but after you've seen the classics and make your way into the B's there's nothing wrong with putting it on for some fun. As I mentioned earlier The Mole People is available on DVD as part of The Classic Sci-Fi Ultimate Collection . If you're interested in 50's sci-fi then this is a must-own set. It’s too bad that Virgil W. Vogel didn’t understand that sometimes (especially when you have bad costumes) what you DON’T see is scarier than what you DO see. Thanks, Nate! Thanks also for letting me into the Blogathon late. 83 is pretty good, what surprises me more when we start playing with numbers are the more trivial items about her life. 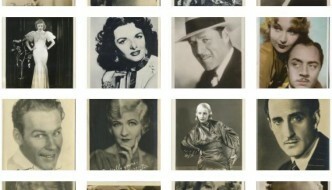 It’s been 79 years since her film debut and 62 years since her last feature film release! Also 62 years since her divorce from John Agar. There’s a long and full life between all of those landmarks! You know, I can accept the bug-eyed faces, that’s par for the course, but the humps on the Mole People backs really cheapen them. Nathanael, have you seen Jerry Warren’s The Wild World of Batwoman? He lifted entire scenes from The Mole People, just to pretend that his villain had minions. I like the idea of The Mole People. So many monster movies thought it was enough to have a good guy, a bad guy and a monster. The Mole People goes hog wild with imagination to conjure up some sort of plot consistency. Does it help? Well, no. But I’ll give it marks for trying. Cliff, this is a literate and well researched review, with a side helping of passion. I like. Thanks so much, Hal. Doctor Baxter got me so whipped up at the start of things with his enthusiastic presentation that I think that passion just carried through to my keyboard on this one. I like “The Mole People” too but then I’m a sucker for lost civilization movies. 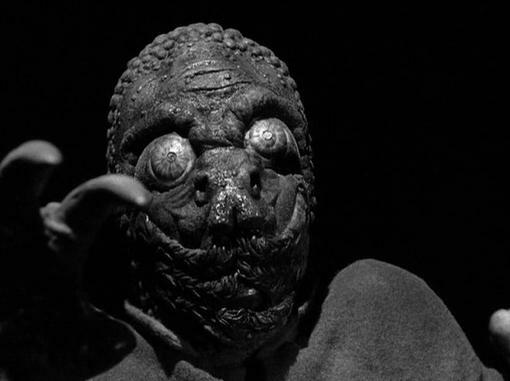 There’s no denying that look of the Mole People is one of the most distinctive of the 1950s. I do agree with you about the ending. Talk about a re-write. But it does make it stand out from other movies of the period, so you have to give it that. After watching and doing some reading on it I kept wondering how everyone thought it was so terrible yet in the next breath choose to compare it to Lost Horizon! Okay, it’s no Lost Horizon and I understand the comparison but shoot, even to get your mind drifting towards Lost Horizon has to be worth something! I guess I can always press the stop button 30 seconds early. I was stuck with a film I’d never seen and didn’t much like, but I’m doing the best I can with my review for tomorrow. So far, it’s been fun. Thanks, Yvette. You know I was sure I’d seen this one, but if I had I didn’t remember it at all. Eh, maybe when I was a kid, I don’t know. I’m sure you’ll do great, I’ll be looking forward to it! I did get a chance to read Kevyn’s Them! piece because it was up late last night, but I’ll be digesting the rest of Day 1 late tonight when I have some free time. Did it have a song? That title just cries out for a finger-snapping ditty of some sort. I’m a sucker for Alan Napier. I hope to catch this some late night or early morning. Enjoyed your article very much. No, @e324244fad5772057df7f8469751b626:disqus , no song. Thanks so much! I don’t dislike The Mole People but you’re definitely more generous to the movie that I would be. I’m just not a fan of the smirky Agar, though I do admit seeing Hugh Beaumont in this one is good for a few snickers. And I feel sorry for Nestor Paiva…why do I suspect he had a clause in his contract that stipulated he had to appear in these things? 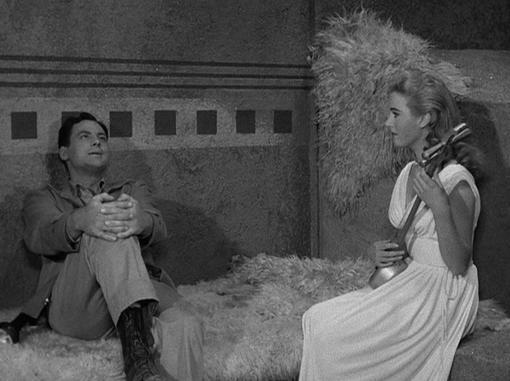 They really didn’t give Hugh Beaumont much to do, did they? Heading over to you next, Ivan, I see you’ve got Agar with Nestor Paiva as well! has plenty of holes, but maybe it’s nostalgia – I love to watch it! that! 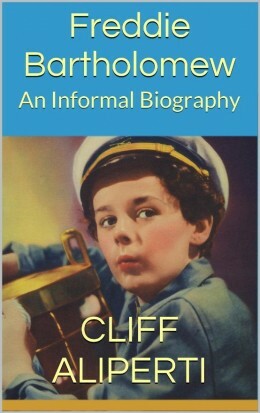 Really fun contribution to the Blogathon, Cliff! Thanks, Becky! I signed on so late that my one criteria was to pick a John Agar movie. My father grew up with these 50’s sci-fi movies and I don’t know how many times I’ve heard him bring up Agar! The mole people look a lot like sleestacks. Is that where they got the inspiration for “The Land of the Lost”? You’ve convinced me to put this one in my queue. It’s on a double disc with Tarantula, so that should be interesting. Great post! Thanks, KC! Hmm, I didn’t run into any info re: Land of the Lost. Yeah, it’s a fun DVD set with a few others as well (I think Monolith Monsters also in the set). Great review, Cliff, with excellent screencaps. I’ll keep an eye out for this movie. And like Kevin, I have a weakness for “lost civilization” stories. I vote that someone combines this movie with She so that we can create the ultimate viewing experience: Mistress of the Mole People. Thanks Rachel. Trying to think if the world really needs Mistress of the Mole People though. By the way, there is an albino “exotic” dancer here, heavy stress on the quote marks. I think you probably want her story. This movie must have some kind of historical standing, as it seems to be the only film where you get to see footage of BOTH John Agar & Sir Edmund Hillary combined! 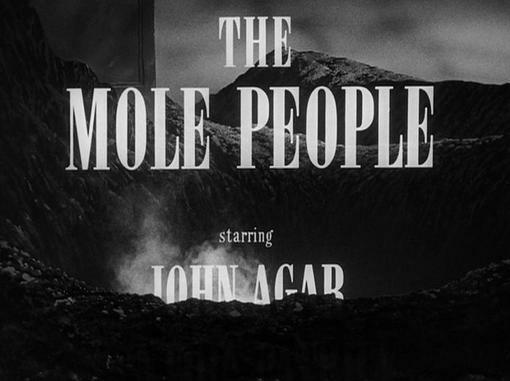 I kinda like THE MOLE PEOPLE, as I’m also an Agar fan (and the doc at the beginning is really terrific). And it’s the only film I can recall that has a flashlight as a secret weapon. 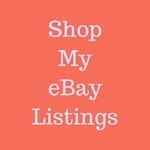 Enjoyed your great post! My friend and I saw iit in 1956. We kept Remember the eye as a way to recall that something you fear may be the way out. Why did you think the ending was bad? We still remember the Eye. Sorry for my delay getting back to you–it’s been a little over three years since I wrote this, so I wanted to check out the end again and see what I thought. Without spoiling it for anyone else I’m pretty sure I meant the end result of that little tremor, which costs us someone I didn’t think we had to lose. It played a little better for me this time, but then I didn’t watch the entire film just now, only the last five minutes. I saw this movie when I was about 9 at the Saturday kid show. It scared me so much–the idea scared me, anyway. I’m going to rewatch it somehow just because I found your review! Thanks so much. @nptexas – I hope you enjoy it once you get to see it again! It’ll probably give you more chuckles than scares now, but it’s still a fun movie. Enjoy! Hi Rickey, this little IMDB mini-bio says she eventually left acting for real estate. Good source too. as a true fan of science fiction, and especially all those 1950s B movies, i find attack of the mole people to be a very good film. not alive in that decade, i ask myself if i was would i have gone back to the theater to see the movie a few times (for you youngsters this was before netflix, DVRs, and even VHS), and the answer is a definite yes. not on par with forbidden planet or the day the earth stood still, but right up there with films like it came from outer space and creature of the black lagoon. Thanks for taking time to comment, Bob. I’ve caught this one a couple of more times since I wrote this, and I actually think I like it even better than when I put this together! I’m a huge fan of The Day the Earth Stood Still, that and Earth vs. The Flying Saucers (1956) were the first ’50s sci-fi that I fell in love with when I was a kid. 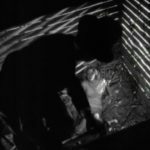 One semi-recent discovery that I enjoyed was The Crawling Eye (1958): I was surprised by it’s low overall IMDb rating, I thought it was a lot of fun when I first caught it a few months ago.